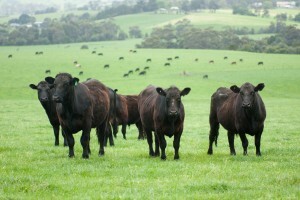 Both companies state that the “Twenty20 Beef Club” will afford Members a guaranteed market for their heifers and steers with a predictable and transparent pricing formula at time of slaughter; a production blueprint supported by safe and secure high-quality farm inputs and leading-edge technical advice. 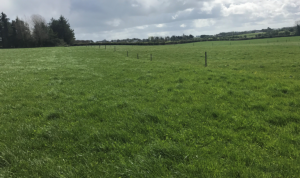 This year will be a pilot year for the programme, with a target of 6,000 calves from Glanbia Ireland supplier dairy farms in the Republic of Ireland. Over the coming years Glanbia Ireland and Kepak have ambitious plans to rapidly expand numbers in the programme to 50,000 per annum. Glanbia Co-op has provided funding for the pilot phase to allow its Members of the Twenty20 Beef Club to benefit from an advanced payment of up to €770 per animal to provide cashflow during the animal’s lifetime. 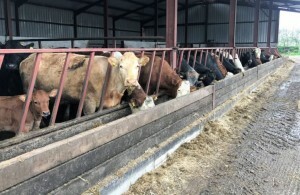 This optional programme component, administered by Finance Ireland, will pay a Twenty20 Beef Club Member €35 per animal per month from months 3 to 24. 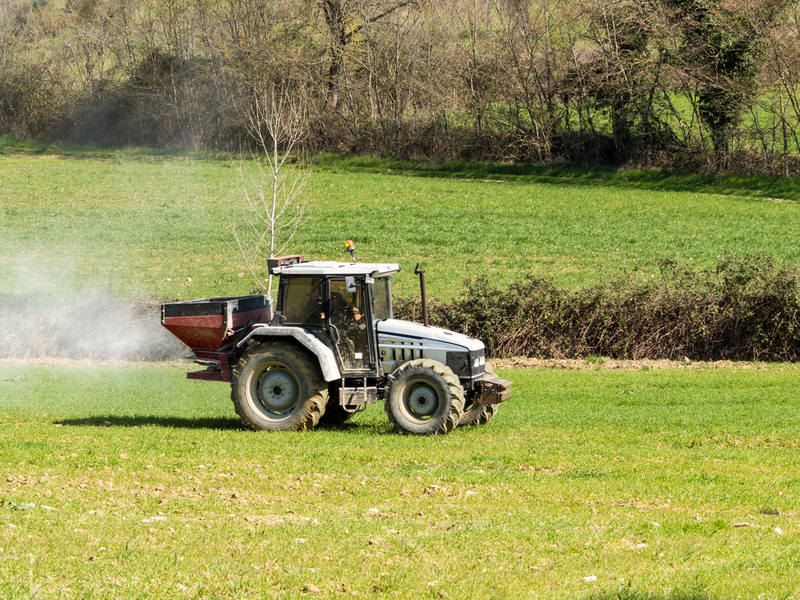 Glanbia Ireland and Kepak Group are in discussions with Finance Ireland whereby this advance payment option would be offered to all qualifying Club Members after the pilot phase. 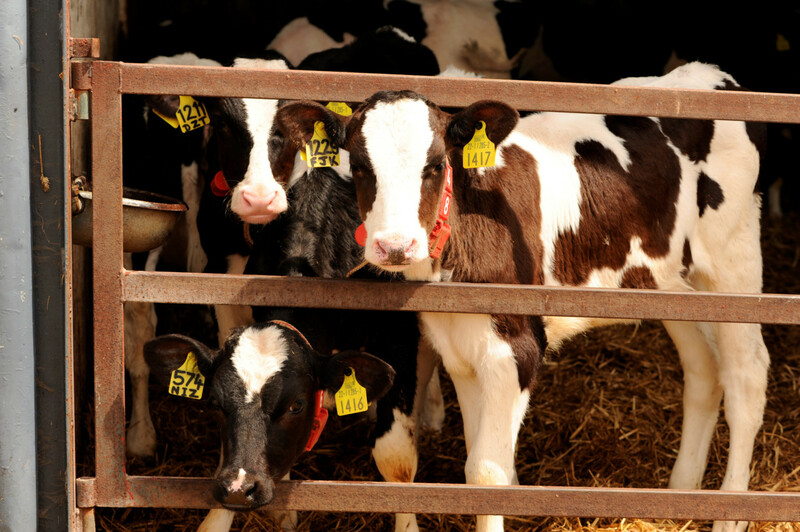 Members can be either dairy farmers or beef finishers, with a minimum of 25 calves required per farm. Suckler farmers that purchase dairy beef calves can also enroll qualifying animals bred and produced on their own farm that meet the Club criteria in the programme. Animals enrolled in the first two years (2019 and 2020) of the Club will be paid the average market price, plus a Club Premium of 15 to 25 cent per kg, as well as a Club Protocol Bonus of 12 c/kg. Club Members will also benefit from additional price support in the event of a weak market price (see examples in Appendix). There will also be a “seasonality” bonus to promote the marketing of animals in April (+6c/kg), May (+10c/kg) and June (+6c/kg). Members of the Club will also be eligible for Angus or Hereford breed bonus payments, which are guaranteed at the point of entry for the pilot phase. 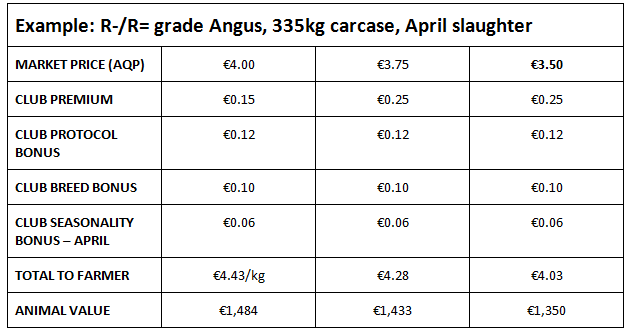 At an average market base price of €4.00/kg, a Twenty20 Beef Club Angus steer slaughtered in April 2021 will qualify for a net price of €4.43/kg; at a market price of €3.75/kg, the same animal would earn €4.28/kg. To assure the feed and food safety credentials of beef from the Twenty20 Beef Club and to deliver the optimum animal performance, all relevant farm inputs consumed by Club herd will be sourced and supplied by Glanbia Ireland (GI). GI and Kepak technical teams will provide farm support and nutritional advice to participating farmers. 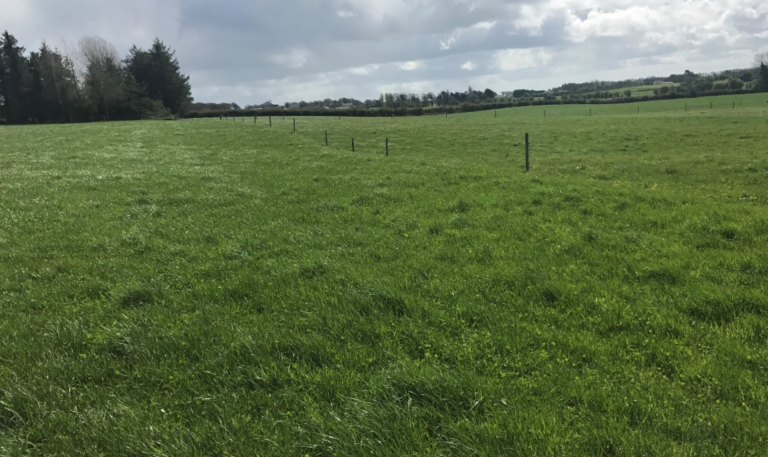 Guidance on sire selection to optimise animal performance and eating quality, on meeting market requirements and on slaughter timings will be provided to Club Members by Kepak’s agriculture team. For the beef customer, this will create a high quality “closed loop” supply chain from animal genetics through to the market place. Members of the Club will be required to strictly adhere to a defined rearing programme – jointly developed by Glanbia Ireland and Kepak. An increase in beef output and sales value per hectare – through enhanced on farm efficiencies, breeding, feeding, grassland management, animal health/welfare and slaughter preparation and selection. IFA President Joe Healy said the Glanbia/Kepak Twenty/20 Beef Club represents much-needed new thinking for the sector. He said the model on dairy beef could deliver greater certainty on beef prices and better cashflow on farms. The IFA President said the contract-style pricing arrangement which Glanbia pioneered on dairy has worked well for dairy farmers and this move on beef could be a first step in a similar direction. However, he said some of the detail needs closer examination. “There would be concerns among farmers about having to purchase all of their inputs for all of their enterprises from Glanbia,” he said. Must be Glanbia Co-op members (ROI) or Kepak suppliers. Can be either dairy farmers, suckler farmers or beef finishers. All animal breeds (incl Friesian, Angus and Hereford) with the exception of Jersey and Jersey crosses. Objective selection criteria applied if oversubscribed – including trading history with GI/Kepak and animal genetics. 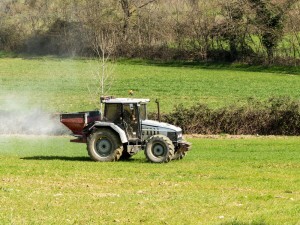 Members must have the capability to adhere to strict production & farming standards. An Advance Payment Package will be available to all Glanbia Co-op members participating in the Pilot Programme (2019); thereafter it be will available to all credit approved Club members (subject to funding being secured). 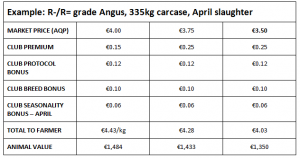 At the time of slaughter, Members will be paid the balance due on the carcase’s value in excess of €770 per animal; the €770 plus interest will at that stage be re-paid to the finance provider. The Advance Payment Package will ensure a consistent cash flow to Club Members over the life of the animal. An interest charge of 3.75% will be charged against the funds provided as an advance payment. Where the market price falls under €3.85c/kg the Club Premium will increase cent for cent with any market decline up to a maximum premium of 0.25c/kg.